Want to optimize your work management? 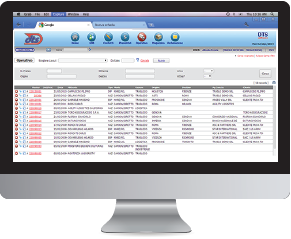 DTS is a management software for moving businesses. The software was born and developed through direct collaboration with the most important moving companies in Italy, and it therefore addresses all possible needs in your field. From contact acquisition to invoices, DTS manages every aspect of a mover’s job: preparing estimates, managing operating practices, checking costs, planning services and resources, stock management and business administration through accurate statistics. DTS works online and doesn’t require any installation on your computer. You can access it from your office, from home and from your smartphone/tablet. Plus, you won’t waste your time looking for phone numbers or information, as everything is shared among coworkers and reachable in a few clicks. Clean your desk, save paper and get ready to step into the future, DTS will revolution your way of working. Every person who calls or emails you asking for information is a possible customer. With the Lead management form, you can quickly record data from the person calling, even during the call itself! From the estimate preparation to managing each phase of the moving, sales and operative job are the heart of our software. In each job, you will find detailed information of the individual job and be able to manage everything effortlessly. Issue the invoice for a job or an invoice draft to send to your administrative department. For each job you can issue more invoices, even to different recipients, and keep track of the payments. Once you start using DTS you can never do without, not only for your daily managing, but also for searching, analyzing and printing all kinds of data and statistics. A real mine of information, which we already have at home but that we are unable to exploit at its fullest. I am extremely happy to be using the operative software DTS: my company definitely needed a personalized managing software to aid our moving business with operative procedures and with facilitating access to costs and profit margins for each practice. With DTS I found all of this together with permanent technical assistance, continuous updates and improvements and an incredibly competitive monthly fee. I have no hesitation therefore to recommend it to colleagues in my field. Managing an international moving business can be a very complex process, involving various entities in different time stages… Such process cannot exclude the usage of a managing software that aids the company in keeping data, communications and service standardizations. DTS is the only existing tool in Italy that meets all these requirements… and much more. We were born with DTS and this software is supporting our growth, with ever-improving performances!